It's taken me a while to get around to trying the Pentachord fragrances from Tauer Perfumes, mainly just because they were difficult to find in New York City for a while and I never quite seemed to get around to placing a sample order. When I did finally try them this month, it was immediately apparent that White was my favorite of the three. Like its fellow Pentachords, White is composed from five synthetic ingredients — no more, no less. In this case, the fragrance's central idea is "the clear melody of royal iris" and its notes are iris root, violet, rosewood, ambergris and Bourbon vanilla. The official description for Pentachord White evokes "a white clean garden" that combines the "crisp beauty" of its flowers with the "warmth" of its trees and background. I'm noticing much more crispness than warmth in White: the note that makes the strongest impression on me is a cool, silvery-green violet. The violet never really gives way entirely to the softly rooty iris; the two notes intertwine, but the violet remains more prominent. The composition does not, as Tauer has noted, develop as a traditional "pyramid." The vanilla becomes noticeable a while after the floral/leaf/root notes, but it adds just a drop of sweetness without pushing anything into "gourmand" territory, and the faint haze of ambergris doesn't distract much from the enduring iris-violet effect. You may very well like White if you enjoy Les Nez Unicorn Spell or Serge Lutens Bas de Soie (although it is far less "retro" than the latter example). White feels more typically feminine than Tauer's Verdant, although it could still be worn by a man with a taste for these particular notes. I won't be giving up Guerlain Après l'Ondée, my favorite fragrance in the violet-iris category, anytime soon, but White does offer a nicely streamlined alternative for days when I'm feeling more minimalist than usual. 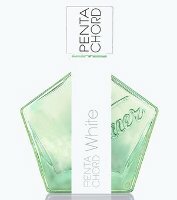 Tauer Perfumes Pentachord White is available as 50 ml Eau de Parfum ($150). For purchasing information, see the listing for Tauer Perfumes under Perfume Houses. 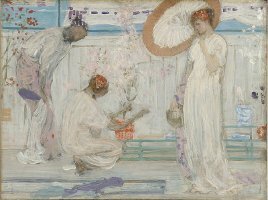 Note: image is James McNeill Whistler, The White Symphony (Three Girls), via Wikimedia Commons. I’ve tried several Tauers and liked them, but not loved them enough to buy. But iris and violet? This is a must try Thanks for reviewing it. I admire most of the Tauers when I smell them, but I can only *wear* a few of them… and White is one I can definitely wear! Oh, how strange! My experience has been the opposite… Carillon pour un Ange was the first one I enjoyed on my own skin, followed by Zeta and Une Rose Vermeille and now White. The earlier releases weren’t quite my taste, although I enjoyed smelling them and thinking about them. My notes for Verdant are even worse. Suffice it to say that Verdant was one of only two perfumes so far (the other being Iris Silver Mist) to trigger a vomiting reflex in me. I will say, I have not had good luck with Tauers so far. The only one I have really liked is Zeta, which I can only wear at bedtime because it is guaranteed to put me to sleep (linden does that to me, as does orange blossom). A few others have been in the category of “interesting to smell, but not something I would actually wear”. Sigh! I just don’t get the Tauer love, which is a shame, because I do like to support indie perfumers. Funny that you bring up Lutens ISM, because the “coolness” Jessica describes as being prominent in this perfume immediately put me in mind of that particular juice. I’m a big fan of the former so I’ll be trying this soon (love Tauer!) but you’re not alone 50_Roses: my hubby swears tha ISM smells like “rotten Aqua Net” and hates when I wear it. Guess it’s the nasal equivalent of man-repellent fashion LOL! P.S. “Enchilada Sauce” for Unicorn Spell? Really? Does it mean there’s something wrong with me that your description really makes me want to try it? Really! Something about The Unicorn Spell smells just like the gravy they put on the enchiladas at my favorite Mexican restaurant. Now, I love enchiladas to eat, but I don’t want to smell like one. Of course, YMMV. I want to smell that now too because of the enchilada sauce description. Too funny. It’s so interesting to me when people get completely different experiences with the same fragrance. Bizarre! My original note was, “this is a VIOLET fragrance! !” I wonder why we got such different impressions. I like Zeta, too, though. Thanks for the review Jessica. How didi you find the sillage and lasting power? Hi, Annemarie! The lasting power was good for an Eau de Parfum (I got a full afternoon of noticeable scent) and the sillage was lower than I expected, which is fine with me! Thanks for the review, Jessica. I’ve tried all of them and White is my favourite as well, but I am not in love with it. My favourite Tauer is Une Rose Chypree. It’s one of the very few rose fragrances that I really enjoy. LadyM, I think I’ve only tried that one once… need to try it again! Hi Jessica. White was indeed very intriguing to me and I found myself ALMOST loving it… and I’ve found it quirky enough to think I might really want to have a bottle, but I still have big reservations. I do, in fact, like Unicorn Spell and Bas de Soie, but I never thought about any relation to those. What I really liked — loved in fact — about White is the unique combination of iris & vanilla, and the interplay between those is what held my interest and kept me thinking about the scent for a long time. However, the major false note in this chord for me was the “ambergris” — which in this case smells to my nose like an overdose of the aromachemical Ambroxan, which I don’t always mind, but in this composition seems to overwhelm and sort of ruin the composition for me. (Note that I’m only guessing that Ambroxan is the culprit — I’m not an aromachemical expert.) Neither violet nor rosewood were so prominent to me. This Tauer has made me realize that I would love to find a perfect iris-vanilla scent; this one is close, and I’d give it a 7 out of 10 points maybe, but it’s not quite there for me. I should mention I did not like Verdant at all, and haven’t tried Auburn. Intriguing. Iris and vanilla are not two scents I think of readilly pairing, perhaps because their traditional characters–cool/dry and warm/sweet, respectively–seem so contradictory. But I imagine therein lies the potential for magic. Now your comment begs the question: anyone know of any good Iris/Vanilla combos out there? What do both of you think of Guerlain’s Iris Ganache? I haven’t tried it in a while, but I remember liking its iris-vanilla mix. I’m a big Tauer-head; the man can almost do no wrong in my opinion. However, I really think of the Pentachords more as an art experiment in some ways; I don’t find any of them super-wearable, but White is definitely the most wearable of the three (to me). Verdant I find incredibly interesting but challenging and not wearable on a regular basis. Auburn I don’t care for, it’s the cinnamon, which is a deal-breaker for me. The metallic aspect of White, to me, was predominant. I describe it as the perfume I would imagine Princess Leia wearing: regal, white, vaguely otherworldly/spacey, metallic, strong, yet very feminine. I love this idea for Princess Leia! That cool, metallic aspect would suit her very well! I am loving seeing how everyone reacts to this – it was the last perfume I tried that I had to get off me. I’m pretty tolerant, too – I gave Secretions a good go of it. But White? nope. I love Andy and want to support him, but that is not one that will go in my collection .I have a sample of Verdant somewhere, I think, and have been nervous about trying it, lol. Once bitten and all that. This is so interesting to me, too — so many varied reactions to what I thought would be a fairly simple/straightforward fragrance to discuss! Perhaps Andy Tauer’s claim to fame should be that he makes perfume interesting enough that people disagree about its effects? That’s more than we can say about many fragrance lines/releases, right?! I hope you’ll have the opportunity to try it, then! Violet and iris are two of my favourite notes, and I generally like Tauer perfumes (although, Jessica, I think I’m the opposite of you — I find the earlier perfumes more interesting / wearable, and Carillon pour une Ange and Zeta are too linear and flowery on me). However, I find White a tough one to wear. I guess it’s the ambergris (which I don’t have a ton of experience with), but this perfume is medicinal from the moment I put it on, straight through to the end. My initial notes were that it was an incense-y, medicinal violet, which wasn’t a combination I’d ever wanted to smell. The astringent medicine with a touch of incense overpowers everything. I can smell a bit of violet / iris, changing later to vanilla, underneath, but most of what I can smell is incense & medicine. I’ve got it on right now, my third try in two months, and my impression hasn’t changed. Like 50_roses and Tama, I really disliked this scent. Once I saw the title of your review I even went back and tried it one more time before reading your review…but I just do not find it pleasant. From the list of notes I really thought I would though! Now that the little dab on my arm has been sitting for a few hours, I totally see the chocolate scratch off sticker analogy! This was the only Tauer I have tried so far, and unfortunately I’m not in a hurry to try others, but more $ saved for something else right?! Very true! And, as you can see from the comments, everyone has her/his own favorite Tauer, so you should definitely try a few more! I tried a number of Tauer’s perfumes, and I cannot bring myself to like any of them. In my very personal opinion and with no claim of being a perfumista, I find most of them being like very good amatorial attempts to make interesting perfumes. I know that might sound very arrogant, but I find his perfumes sort of unpolished and “unfocused”, if that makes any sense. I disliked L’Air Du Desert Marocain, to me it is a messy mix of too many ingredients that happen to smell oriental, and I disliked the Pentachord line (Verdant and Auburn in particular) for being sort of forced minimalist and synthetic. Lonestar Memories to me it was L’Air du Desert with leather That said, I really like Tauer’s approchability, his lovely website, and the interesting “backstage” stories. Oh, and I dislike the bottles End of my rant!